Ratic Shad Buggs are the first tied jigs that dart back and forth on the retrieve. This action is deadly on all game fish, and is utilized in hundreds of different soft plastic and hard baits. They're tied with a special combination of rabbit strips, flash, lead weights, and other popular fly tying materials. These materials form a realistic profile that looks alive when swimming or on the fall. Ratic Shad Buggs imitate shad, one of the most widely distributed bait fish in the United States. 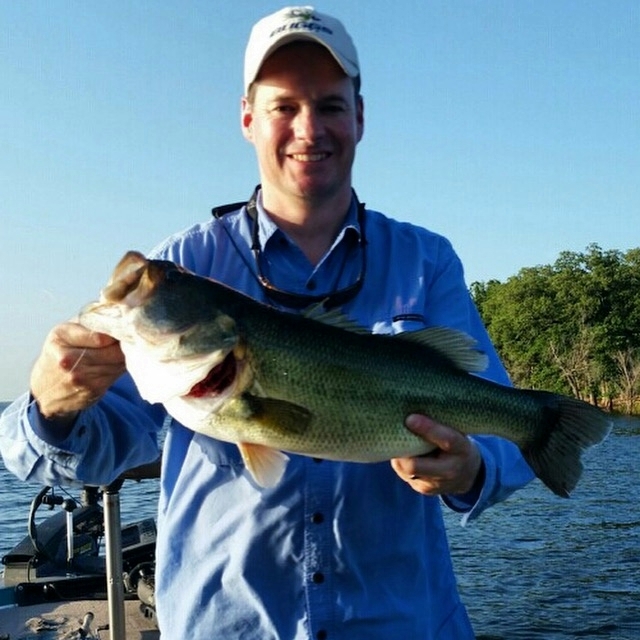 In large freshwater lakes and rivers, all of the most sought after game fish eat shad, including largemouth bass, striped bass, spotted bass, crappie, and white bass. In saltwater marshes, bays, and creeks you'll find snook, striped bass, speckled trout, redfish, flounder, and tarpon chasing shad and similar baitfish. We are incredibly excited to release these jigs. Ratic Shad Buggs come in two sizes. The top size is 3" long, and weighs 3/8 oz. when wet. The bottom size is 2.5" long, and weights 1/4 oz. when wet. Just like the baitfish they imitate, these jigs have a prominent spot behind their eyes. Flash extends from the sides to the tail, and they have a special accent fiber at their throat. 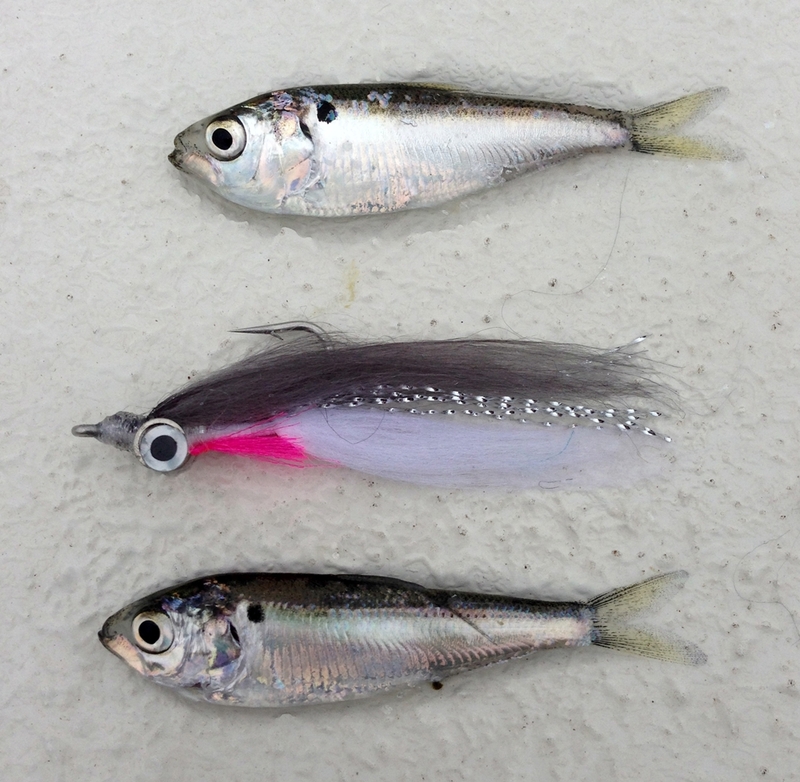 Ratic Shad Buggs sink slowly, making them more effective when game fish are pursuing shad near the surface. When retrieved, they dart back and forth with an erratic action as you twitch your rod tip. They fall evenly, and the rabbit strips they're tied with give them lots of action. Click Here to Buy Ratic Shad Buggs in the Online Store! Below is the story behind this jig, including the famous fly fishing guide who was eager to help, the fly tyer who imitated a soft plastic and helped inspire the design, the new components we developed to make it possible, and the early success catching what Lefty Kreh calls the biggest challenge he's faced as a fly fisherman. All relevant links are included at the end. That name rung a bell, and I remembered reading some of the articles he wrote and learning about the flies he designed for Umpqua Feather Merchants. Umpqua is the biggest name in flies, and so I knew he was talented. What I didn't know was how willing Henry was to tell me about striper fishing on Lanier and the type of Bugg he thought they'd hit. Somehow Jake convinced Henry to call me, and I eagerly took his call and proceeded to talk with him for over an hour. He was full of advice and encouragement, and started me down the path that led to Ratic Shad Buggs. The Sellers SST fly is tied by a man named Dave Sellers. He was challenged to come up with a fly that would mimic the darting, erratic action of a Super Fluke. The Super Fluke is a soft plastic baitfish imitation, popular with all types of fishermen. After "obsessing over it for three months" Dave figured it out. The key was the placement of the weight. When the weight was placed at the back of the fly, near the bend of the hook, that darting, erratic action was achieved. I found the story and recipe on Dan Blanton's website, and saw how Dave was able to get the weight back there. Then the wheels began turning.... Dave tied his fly on an Eagle Claw 413 jig hook, the same hook I use on my bonefish jigs. I had some laying around, and was a fan of the hooks. They're strong, made for saltwater fishing, sharp right out of the box, and reasonably priced. Then I started thinking about the weight. I didn't have one, but I had an old idea in my head and maybe this was just the excuse to get something made. I had experimented with tungsten shrimp body weights on a mullet prototype. They worked fairly well, but were too light. And tungsten molds were a lot more expensive than lead. But the tungsten weights gave me a starting point for the idea. I made a call to my friend Steve at Mineral Springs Casting Company. I described to him a half-oval shaped lead weight that would have a groove in the top for a hook shank and ribs on the side. He said it wouldn't be a problem and asked me to send him specs. I sent him specs for two sizes, 1/8 oz. and 1/16 oz. He wasn't kidding when he said it wouldn't be a problem. A couple of weeks later my first shipment arrived and they were spot on! Above on the left you'll see the tungsten weights I was talking about. In the middle are the 1/16th oz. Buggs Belly Weights, and then on the right are the 1/8th oz. With the weights in hand, I determined that tying stainless steel wire to the hook shank gave me a way to attach the weight where I needed it near the bend. This would form the foundation for Ratic Shad Buggs. At this point I had to smile. A fly tyer figured out how to mimic the action of a conventional lure. Now I was was using the fly tyer's idea to bring it back to the conventional side of things. As I brought it back, my goal was the same with all of my Buggs. Use my skill as a tyer, with rabbit strips as the main ingredient, to create an effective fishing lure while drawing inspiration from the best fly patterns and fly fishermen. During our conversations about the flies he ties for stripers, Henry told me about a flash material he uses for the throat. It's called fluoro fibre, and he absolutely raved about the way it shines in the water and seems to change colors in the sunlight. I couldn't ignore this advice, so I sought it out and found a healthy supply. A couple weeks later I received another testament to the character of Henry Cowen. On that Christmas Day fishing trip Henry fished alongside a couple guys who saw him catch lots of fish on his Ratic Shad Buggs. They were conventional anglers, and Henry gave them a couple of Buggs to try for themselves. I received an email from one of the guys, wondering where he could buy some more. They had caught some really good fish on them and we had a nice conversation. They bought a healthy supply and have been sending me pictures every week of the stripers they're catching on Ratic Shad Buggs. Recently I traveled to South Louisiana and left several from the first production run with my friend, fishing guide Jeff Arnold. He's sight casted several redfish with the 3" version, as has my friend Rex DeGuzman. And I can't wait for the spring when thousands of shad roam the bay system and get crushed by speckled trout. Ratic! is an abbreviated version of “erratic” and is now a Buggs trademark. (So Hippel, why would you trademark the name if you didn't have other ideas for this type of lure? Answer: You're pretty quick!) I knew erratic would be too much of a mouthful, but I wanted the unique action of these lures to be included in the name. So Ratic! it was. You'll see an exclamation point on the packaging. This represents the excitement I have for the action of this lure. The possibilities are endless! Well I'm glad you asked. As with all Buggs, tie on your Ratic Shad Buggs and hold them under the water. Now squeeze the rabbit strips between your fingers and watch the little air bubbles escape. The rabbit hide holds little air pockets, and when you squeeze the hide two things will happen. First, the hide will absorb water, making your Buggs heavier and easier to cast. Second, your Buggs will absolutely come alive! 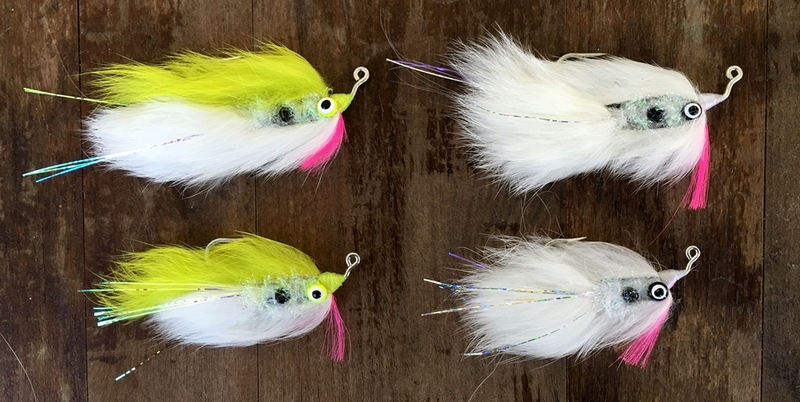 Nothing moves like rabbit strips, and Ratic Shad Buggs are no exception. Once it's wet, soaked all the way through, make your cast and let it sink a little. It falls evenly, and the rabbit strips give it great action. You might get hit on the fall so make sure you're holding on tight! 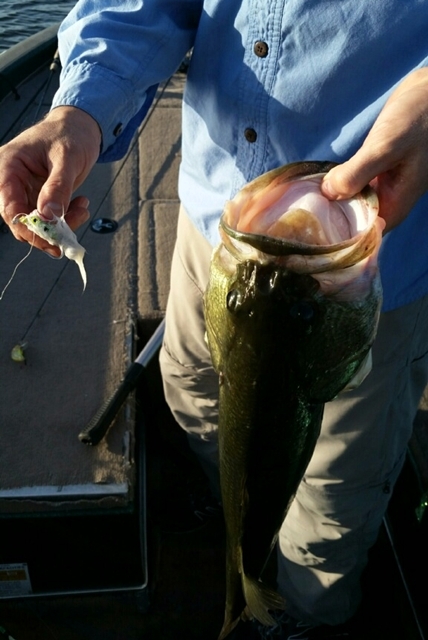 Work it back to you with a slow and steady twitching retrieve, like you would fish a topwater. Give it a twitch and then a little slack, and repeat. You'll see it dart from side to side as you do this, and you'll see that Ratic! action I'm talking about. There are two sizes, and they both have the same action. The 2.5” version will be about ¼ oz. when it gets wet. If you're not getting enough distance, tandem rig two Ratic Shad Buggs and watch them dart in unison! The 3” version is 3/8 oz. when wet, plenty heavy on most rigs to get good distance on your casts. They both sink slowly, an important factor when fish are chasing shad near the surface and when sight casting in shallow water. I do this for several reasons. I get a creative outlet, a way to think about fishing when I can't be on the water, and because I believe God gave me a gift and I want to glorify Him with it. And the payoff occurs when I see you, with a big smile on your face, holding a fish with a Bugg in it's mouth. I feel like I was right there with you, and it makes my day! Let me invite you to write your own chapter, and experience your own success with these lures. Consider buying a few of these Ratic Shad Buggs or one of the kits we're making available. I know they'll work in lots of different places, on lots of different fish, and I can't wait to see your pictures and get your reports! Any questions? My contact information is below. Buy Ratic Shad Buggs in the Online Store. In the Atlanta area? Go go fish with Henry Cowen! Tie the Dropper Loop to Tandem Rig your Buggs. Read about the Sellers SST Fly and See the Recipe. Need Custom Jig Heads or Weights? Talk to Mineral Springs Casting Company. Fish with Alaska and South Louisana Fishing Guide Jeff Arnold.